The First Electrical Workers Union In York. In July of 1904 a man named E.P. Allman who was the 3rd District Vice President of the IBEW came to York. He gathered electrical workers and chartered IBEW Local 469 as a "mixed" local of wireman and lineman. The first president of Local 469 was a 27 year old man named Effinger Lucas. Recording Secretary was Dwight (G.M.) Wallick and Financial Secretary was a man named H. (Harry) Gundlach. By October 1904 George Gorhrig took over as Financial Secretary. It is reported in the June 1905 Journal of Electrical Workers by Grand President Frank McNullty that Local 469 is "a young local that is growing". Over this time period, Local 469 is initiating 2 new members per month and has a total of 41 members leaving only about 10 electrical workers in York who were not in Local 469. The members of 469 would hold their union meetings on Tuesday nights at a place called "Free's Hall" at 42 N. George St. As a mixed local they worked to bring the local electrical firms to agreements and also the telephone and power companies that employed the linemen. Some of these early companies that Local 469 worked to organize were the York Tel. Telegraph Company which was part of what we know as AT&T and John E. Graybill & Co. which performed early electrical construction work in York. President- Effinger Lucas, 245 Prospect St.
Financial Secretary - Chauncey F.B. Stough, 504 N. Water St.
Recording Secretary - J. W. Allamang, 36 W. Princess St.
Treasurer - C. R. Beitman, 342 Smyser St. In later years Chauncey Stough and Effinger Lucas were partner's in Stough & Lucas Electrical in York. This company had continued on and off relations with the IBEW in York. It is unclear what actually happened because of lack of information but sometime in 1910 Local 469 went defunct. There is very little information on Local 557 but it is known that it lasted until about March 1915 before going defunct. The number 557 is now carried by Saginaw Michigan. 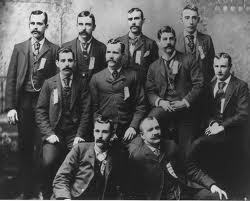 The first IBEW Local to hold the #229 was in Manchester, New Hampshire. This local received charter in March 1902. Times were tough and the Manchester local was constantly in arrears of its I.O. per capita payment. By September of 1906 it was declared defunct. The next Local to receive the #229 was a "mixed" local in Henderson, Kentucky. Local 229 in Henderson was chartered in April 1916. Hard times befell this local early on and it was declared defunct by March of 1917. The #229 charter was given to York, PA on March 30, 1918 by IBEW president Frank J. McNulty and Secretary Charles Ford. The charter date is back dated to account for when the first meeting was held to organize a union. It is believed that the charter members paid a $1 initiation fee. The new local in York actually began to function in mid April 1918. Even though the charter was written as an "Inside" Local Union, the new Local 229 actually existed as a "mixed" local union of lineman and electricians for many years. Local 229 York, PA was first listed in the April 1918 Journal of the Electrical Workers. Charter Member Lawrence Malehorn was appointed as Recording Secretary and member Jno. Billet as Financial Secretary. The Local held its first meetings at what was know as the "Moul Building" in York. By July of 1918 it was reported by International Rep Chas J. Boyle that Local 229 had its first contract since being organized. They received $0.12 per hour increase, time and one half for overtime, double time for Sundays and Holidays, and one hour shorter work day and that all contractors signed the agreement. It is believed that C.J. Boyle (who was a member of Local 81 in Scranton,PA) was responsible for reorganizing a Local Union in York. He assisted 229 in early disputes and helped ensure survival of the Local. He continued his duties in the IBEW until his tragic death on June 2,1923. Growth was slow for Local 229 in the early days. It is estimated that membership would grow to a high of almost 40 and then die off as employers would consistently attempt to break the union by hiring non-union men and forcing union workers to "scab" in order to put food on the table. This vicious cycle continued for years. It is documented that early in 1920 Local 229 went on strike for over ten weeks. Eventually the inside men got a group of contractors to recognize them but some would refuse to recognize union labor.Some of the shops that were listed as "unfair firms" are still around today and exist as our partner contractors and others are no longer in business. It apparently took a lot longer for the linemen group to be recognized in York. They constantly had to battle it out with the power and telephone companies to recognize them as a unionized group. Thankfully Today, a vast majority of the employees of electric utilities in the York area are members of the IBEW. Financial Secretary - A.D. McGuigan, 982 N. George St.
Recording Secretary - Harvey W. Deardorff, 933 W. College Ave. In December of 1920, Local 229 member Jacob Wapler is killed while performing his work as an electrical worker. His death notice is placed in the Journal of Electrical Workers January 1921. No details are given surrounding the circumstances. This is the only documented incident involving death of a Local 229 member on a job. In early 1923 I.B. Abel & Son reached an agreement with Local 229. In June of 1925 Local 229 has only 16 members. But by spring of 1926 serious headway was being made to stabilize relationships with the electrical contractors of the town. Local 229 had doubled its membership and the first real Labor-Management functions were held during the summer as group picnics. The union contractors formed the "Electrical Club" and worked together with the electricians union to promote better conditions and push back against the "Open Shops" who promoted low wages and standards. A member by the name of Albert Richmond was Local 229's recording secretary and corresponded the events of the mid 1920's to the the Journal of Electrical Workers. Some of the mid 1920's projects that Local 229 electricians worked on were the Strand Capitol Theater,York Town Hotel, and YMCA Building. Growth was still very slow in 1927 and the union was continually up against workers and contractors who would work and pay half of the scale set by the union. This same year, Local 163 in Wilkes-Barre and Local 143 in Harrisburg formed the Pennsylvania State Electrical Workers Association. The function of this was to promote a more unified union movement across the state to assist in growth and stability. The first official convention of the PSEWA was held in Harrisburg on November 15,16 1927. Local 229 was the first local union to pay its per-capita of 5 cents per member. Local 229 continued to grow slowly throughout the 1930's and 40's. Unfortunately very little correspondence came from 229 during this time. It is believed that membership averaged around 25 to 30 members during this time. Many electricians and lineman had to travel to find work. Some would manage to get 2 days per week to try and make ends meet. Many companies used this period to cut wages and try to get workers to drop their union membership. The outbreak of World War 2 spawned vast industrialization in America. Nearly 30 IBEW 229 members served in the armed forces during the war. IBEW 229 members worked on numerous plants such as AMF that constructed weapons and materials for the war effort. By 1948 IBEW 229 has nearly 20 apprentices and holds its classes at the York Technical Institute which was inside of the William Penn High School. The 1950's were years of intense growth for the entire union movement. Local 229 was no exception. Nearly all the electrical contractors in York were signed to the IBEW and the vast amount of electrical work was done by IBEW members. Local 229 members also constructed the top-secret site known as "Site R' in Adams county. This project started in 1954 and was done by the H.P. Foley Co. The listed address for the Local during this time was 972 E. Philadelphia Street in York. The 1960's were big years for organized labor. Local 229 was no exception. During the 1960's Local 229 completed numerous projects and added members. In 1962 Local 229 electricians completed the electrical construction on the fruit Processing plant in Orrtanna PA. This plant was the largest facility east of the Mississippi River at this time. We now know of it as Knouse Foods Orrtanna and Local 229 electricians still maintain the plant nearly 50 years later. The second unit is constructed from 1965 to 1966 by Local Electrical contractor I.B. Abel & Son. The third unit which was the largest transformer at its time with an output of 810 MVA is constructed from 1968 to 1969. The contractor on this project was Ebasco Service, Inc. from New York City. At the peak of the project over 80 electricians worked on site and installed over 15,000 feet of cable tray. The Local Union was in desperate need of a new building. It scurrent location at 130 S. Beaver Street was not serving the membership so in 1965 Local 229 purchased the York Sheer Hosiery Co. building on 300 Hudson St. for $40,000. It was renovated to suit the needs of the Local and served as the main building for many Local Unions in York county. In July of 1967 Local 229 negotiates a contract with the Hadco Lighting Plant in Littlestown PA. There are 40 employees at the time that become Local 229's first "BA" members. In January 1968, the electrical maintenance employees of York City became represented by IBEW Local 229. 1968 was also the 50th anniversary of Local 229. Below is a picture of Harvey W. Deardorff receiving his 50 year membership certificate. Harvey was the first Business Manager of Local 229 which was an unpaid position. Harvey was originally initiated into Local 143 in Harrisburg on June 17th 1918. He then joined Local 229 a short period later. Brother Deardorff served the Local as financial secretary and treasurer for many years until his retirement in 1963. The construction of Peach Bottom was the largest scale project ever completed in the York area. Construction Began in 1962 on what is known as Unit 1. This unit was an experimental helium cooled reactor. Construction started in 1966 on Units 2 & 3. At peak construction in early 1973 over 400 electricians worked on the site. On July 24, 2010 IBEW 229 moved into its new location at 555 Willow Springs Lane. This new building was purchased to suit the needs of the expanding membership of Local 229 and to take the Electrical Apprenticeship Program to the next level. with a dedicated 10,000 sq ft to the training center. 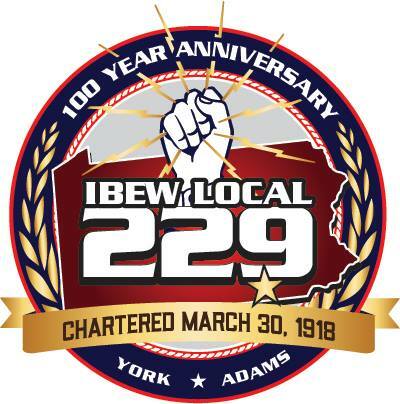 The jurisdiction of present day IBEW Local 229 consists of the entire county of Adams and the county of York except for Carroll, Fairview , Franklin and Monaghan townships. From our first days as Local 469 with a hand full of members to the creation of Local 229 in 1918, we have come along way to get to our present membership of over 420 members.The IBEW Electrical Workers in York have an exciting story of struggle and strife all coupled with an everlasting pride in our trade and Union. ENJOY THE REST OF OUR SITE AND THANK YOU FOR READING OUR STORY!